coasbooks has no other items for sale. "Fascists," "Brownshirts," "jackbooted stormtroopers" - such are the insults typically hurled at conservatives by their liberal opponents. Calling someone a fascist is the fastest way to shut them up, defining their views as beyond the political pale. But who are the real fascists in our midst? Liberal Fascism offers a startling new perspective on the theories and practices that define fascist politics. Replacing conveniently manufactured myths with surprising and enlightening research, Jonah Goldberg reminds us that the original fascists were really on the left, and that liberals from Woodrow Wilson to FDR to Hillary Clinton have advocated policies and principles remarkably similar to those of Hitler's National Socialism and Mussolini's Fascism. Contrary to what most people think, the Nazis were ardent socialists (hence the term "National socialism"). They believed in free health care and guaranteed jobs. They confiscated inherited wealth and spent vast sums on public education. They purged the church from public policy, promoted a new form of pagan spirituality, and inserted the authority of the state into every nook and cranny of daily life. The Nazis declared war on smoking, supported abortion, euthanasia, and gun control. They loathed the free market, provided generous pensions for the elderly, and maintained a strict racial quota system in their universities - where campus speech codes were all the rage. The Nazis led the world in organic farming and alternative medicine. Hitler was a strict vegetarian, and Himmler was an animal rights activist. Do these striking parallels mean that today's liberals are genocidal maniacs, intent on conquering the world and imposing a new racial order? Not at all. Yet it is hard to deny that modern progressivism and classical fascism shared the same intellectual roots. We often forget, for example, that Mussolini and Hitler had many admirers in the United States. W.E.B. Du Bois was inspired by Hitler's Germany, and Irving Berlin praised Mussolini in song. Many fascist tenets were espoused by American progressives like John Dewey and Woodrow Wilson, and FDR incorporated fascist policies in the New Deal. Fascism was an international movement that appeared in different forms in different countries, depending on the vagaries of national culture and temperament. In Germany, fascism appeared as genocidal racist nationalism. In America, it took a "friendlier," more liberal form. The modern heirs of this "friendly fascist" tradition include the New York Times, the Democratic Party, the Ivy League professoriate, and the liberals of Hollywood. The quintessential Liberal Fascist isn't an SS storm trooper; it is a female grade school teacher with an education degree from Brown or Swarthmore. These assertions may sound strange to modern ears, but that is because we have forgotten what fascism is. In this angry, funny, smart, contentious book, Jonah Goldberg turns our preconceptions inside out and shows us the true meaning of Liberal Fascism. "Fascists," "Brownshirts," "jackbooted stormtroopers"--such are the insults typically hurled at conservatives by their liberal opponents. Calling someone a fascist is the fastest way to shut them up, defining their views as beyond the political pale. But who are the real fascists in our midst? Liberal Fascism offers a startling new perspective on the theories and practices that define fascist politics. Replacing conveniently manufactured myths with surprising and enlightening research, Jonah Goldberg reminds us that the original fascists were really on the left, and that liberals from Woodrow Wilson to FDR to Hillary Clinton have advocated policies and principles remarkably similar to those of Hitler's National Socialism and Mussolini's Fascism. Contrary to what most people think, the Nazis were ardent socialists (hence the term "National socialism"). They believed in free health care and guaranteed jobs. They confiscated inherited wealth and spent vast sums on public education. They purged the church from public policy, promoted a new form of pagan spirituality, and inserted the authority of the state into every nook and cranny of daily life. The Nazis declared war on smoking, supported abortion, euthanasia, and gun control. They loathed the free market, provided generous pensions for the elderly, and maintained a strict racial quota system in their universities--where campus speech codes were all the rage. The Nazis led the world in organic farming and alternative medicine. Hitler was a strict vegetarian, and Himmler was an animal rights activist. Do these striking parallels mean that today's liberals are genocidal maniacs, intent on conquering the world and imposing a new racial order? Not at all. Yet it is hard to deny that modern progressivism and classical fascism shared the same intellectual roots. We often forget, for example, that Mussolini and Hitler had many admirers in the United States. W.E.B. Du Bois was inspired by Hitler's Germany, and Irving Berlin praised Mussolini in song. Many fascist tenets were espoused by American progressives like John Dewey and Woodrow Wilson, and FDR incorporated fascist policies in the New Deal. Fascism was an international movement that appeared in different forms in different countries, depending on the vagaries of national culture and temperament. In Germany, fascism appeared as genocidal racist nationalism. In America, it took a "friendlier," more liberal form. The modern heirs of this "friendly fascist" tradition include the New York Times , the Democratic Party, the Ivy League professoriate, and the liberals of Hollywood. The quintessential Liberal Fascist isn't an SS storm trooper; it is a female grade school teacher with an education degree from Brown or Swarthmore. These assertions may sound strange to modern ears, but that is because we have forgotten what fascism is. In this angry, funny, smart, contentious book, Jonah Goldberg turns our preconceptions inside out and shows us the true meaning of Liberal Fascism. "Fascists," "Brownshirts," "jackbooted stormtroopers"such are the insults typically hurled at conservatives by their liberal opponents. Calling someone a fascist is the fastest way to shut them up, defining their views as beyond the political pale. But who are the real fascists in our midst? 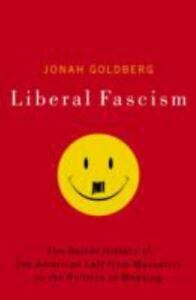 Liberal Fascismoffers a startling new perspective on the theories and practices that define fascist politics. Replacing conveniently manufactured myths with surprising and enlightening research, Jonah Goldberg reminds us that the original fascists were really on the left, and that liberals from Woodrow Wilson to FDR to Hillary Clinton have advocated policies and principles remarkably similar to those of Hitler's National Socialism and Mussolini's Fascism. Contrary to what most people think, the Nazis were ardent socialists (hence the term "National socialism"). They believed in free health care and guaranteed jobs. They confiscated inherited wealth and spent vast sums on public education. They purged the church from public policy, promoted a new form of pagan spirituality, and inserted the authority of the state into every nook and cranny of daily life. The Nazis declared war on smoking, supported abortion, euthanasia, and gun control. They loathed the free market, provided generous pensions for the elderly, and maintained a strict racial quota system in their universitieswhere campus speech codes were all the rage. The Nazis led the world in organic farming and alternative medicine. Hitler was a strict vegetarian, and Himmler was an animal rights activist. Do these striking parallels mean that today's liberals are genocidal maniacs, intent on conquering the world and imposing a new racial order? Not at all. Yet it is hard to deny that modern progressivism and classical fascism shared the same intellectual roots. We often forget, for example, that Mussolini and Hitler had many admirers in the United States. W.E.B. Du Bois was inspired by Hitler's Germany, and Irving Berlin praised Mussolini in song. Many fascist tenets were espoused by American progressives like John Dewey and Woodrow Wilson, and FDR incorporated fascist policies in the New Deal. Fascism was an international movement that appeared in different forms in different countries, depending on the vagaries of national culture and temperament. In Germany, fascism appeared as genocidal racist nationalism. In America, it took a "friendlier," more liberal form. The modern heirs of this "friendly fascist" tradition include the New York Times, the Democratic Party, the Ivy League professoriate, and the liberals of Hollywood. The quintessential Liberal Fascist isn't an SS storm trooper; it is a female grade school teacher with an education degree from Brown or Swarthmore. These assertions may sound strange to modern ears, but that is because we have forgotten what fascism is. In this angry, funny, smart, contentious book, Jonah Goldberg turns our preconceptions inside out and shows us the true meaning of Liberal Fascism. -Fascists, - -Brownshirts, - -jackbooted stormtroopers---such are the insults typically hurled at conservatives by their liberal opponents. Calling someone a fascist is the fastest way to shut them up, defining their views as beyond the political pale. But who are the real fascists in our midst? Liberal Fascism offers a startling new perspective on the theories and practices that define fascist politics. Replacing conveniently manufactured myths with surprising and enlightening research, Jonah Goldberg reminds us that the original fascists were really on the left, and that liberals from Woodrow Wilson to FDR to Hillary Clinton have advocated policies and principles remarkably similar to those of Hitler's National Socialism and Mussolini's Fascism. Contrary to what most people think, the Nazis were ardent socialists (hence the term -National socialism-). They believed in free health care and guaranteed jobs. They confiscated inherited wealth and spent vast sums on public education. They purged the church from public policy, promoted a new form of pagan spirituality, and inserted the authority of the state into every nook and cranny of daily life. The Nazis declared war on smoking, supported abortion, euthanasia, and gun control. They loathed the free market, provided generous pensions for the elderly, and maintained a strict racial quota system in their universities--where campus speech codes were all the rage. The Nazis led the world in organic farming and alternative medicine. Hitler was a strict vegetarian, and Himmler was an animal rights activist. Do these striking parallels mean that today's liberals are genocidal maniacs, intent on conquering the world and imposing a new racial order? Not at all. Yet it is hard to deny that modern progressivism and classical fascism shared the same intellectual roots. We often forget, for example, that Mussolini and Hitler had many admirers in the United States. W.E.B. Du Bois was inspired by Hitler's Germany, and Irving Berlin praised Mussolini in song. Many fascist tenets were espoused by American progressives like John Dewey and Woodrow Wilson, and FDR incorporated fascist policies in the New Deal. Fascism was an international movement that appeared in different forms in different countries, depending on the vagaries of national culture and temperament. In Germany, fascism appeared as genocidal racist nationalism. In America, it took a -friendlier, - more liberal form. The modern heirs of this -friendly fascist- tradition include the New York Times , the Democratic Party, the Ivy League professoriate, and the liberals of Hollywood. The quintessential Liberal Fascist isn't an SS storm trooper; it is a female grade school teacher with an education degree from Brown or Swarthmore. These assertions may sound strange to modern ears, but that is because we have forgotten what fascism is. In this angry, funny, smart, contentious book, Jonah Goldberg turns our preconceptions inside out and shows us the true meaning of Liberal Fascism. This book holds a narrow view of history with its intriguing half truths which culminates into a fine example of modern day political mudraking. History is far more complex then this “historian” makes it out to be. Just think, many of the political ideologies of Republicans in President Lincoln’s era are now the those of the Democratic majority. Within this authors thought process,s Mitt Romney would be coined a Moderate Confederate! Superposing “Liberalism” on the stigma of “Fascism” or even its ideologies is just dumb, yet always entertaining like stupid animal tricks. I recommend this book and even bought it for my father. My ONLY words of advice are pick your prophets wisely and always question what you think is false as what you think is true; and what is right will be in the middle. I bought this because I enjoy enormously Jonah Goldberg's published works in the New Hampshire Union Leader, and find myself agreeing with him most of the time. I'd heard this was a bit heady, but was too curious to see his written account of the progression of Liberalism. Personally, I used to consider myself more liberal and no one is more surprised than I at my own progression in the past 10 years to staunch conservative values. Goldberg is funny, brilliant, considerate and witty in his analysis. Highly recommended reading no matter which way you lean. This book is a must read for those who believe in the US Constitution as written by the Founders and who often are slandered by those who don't particularly believe in tolerance and Constitutional law. When I was young, history courses taught how wonderful and benevelent Woodrow Wilson was, and what dreams he had for world peace in his bid to create the League of Nations. From such propaganda given to school children, how can we possibly find that President Wilson did more to erode our Constitution than any single individual before or since. And of course, there really was no difference between FDR, Stalin, Mao, and Hitler...just a little more restraint put upon FDR. People say there's not a dimes worth of difference between Democrats and Republicans. I say they tend toward the Fascist...more particularly, the Democrats. (Can't forget the "me too" Republicans...or RINOs) Obama is a classic Fascist. Not an entertaining read but what a eye-opener!! I guarantee you public school didn't tell you about the truth of the beginnings of progressivism or the popularity of fascism in the USA. For example, I could not understand the left's unreasoning defense of evolution as the sole theory to be taught in school. Jonah made the connection between evolution and the "living Constitution" quite clear. Unless you're as old as me, you've probably not seen a "Mercury" dime. Guess what's on the back- it's as important to fascism as the swastica is to National Socialists! On our coins!! If you want a better understanding of the desperate fight for the soul of our nation, this is a must-read.